It was another 3 hours on to David and Sandie's, where Trevor unloaded Picksy again into the round pen, and we all had coffee before Trevor hit the road again. He headed another 2 hours north where he'd stay for the night, and pick up another lady's float and haul it with Picksy and her 4 horses to Nationals, catching tomorrow night's 7 PM ferry. We would pack tomorrow and head north by dark, to catch the 8 AM Monday ferry. David gave me the history of Holly Farm, in his family for 4 generations, and the rundown on their horses and breeding program and bloodlines, which he knows upside down and inside out. Lots of fascinating history and stories there. 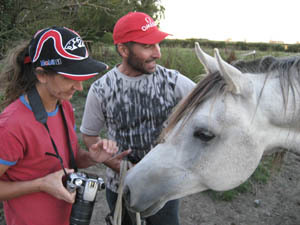 David's dad started breeding Arabians in 1961; David started riding their stallions in endurance in 1978, just to prove that they could do endurance. 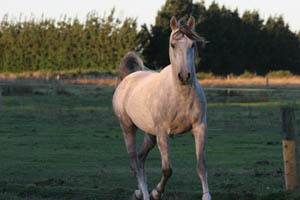 His dad had decided to breed purebred Arabians, and acquired 4 purebred mares to start, and a purebred Crabbet stallion, Silver Sparkle. David's father's lines carry select Crabbet, Russian, and Egyptian blood, and have proved successful in the showring and in endurance. and Arab bloodlines, as well as training them, in the US, Germany, and the UAE. They've got four stallions: Imperial Maakir and Simeon Sapar are Straight Egyptians, and Zaddam and Pradaa are the mix of David's and his father's breeding. The young dark gray Zaddam was the one that made my eyes pop out. 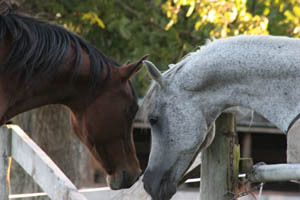 David and Trevor have a partnership in Whitestone's Silver Flame, the 24-year-old gray stallion with a band of mares at Trevor's. The old homestead on Holly Farm dates back to the 1860's (about as old as you'll find in New Zealand). There's chickens and baby ducks, peacocks, pheasants, cows, and a miniature horse that is Trent's horse. Nobody but Trent can catch the little bugger, and his first day home, Trent led him right in the house. He regularly escapes out of his pen, and we had to run in a whole herd of 2-year-olds to separate him out back into his orchard pen. 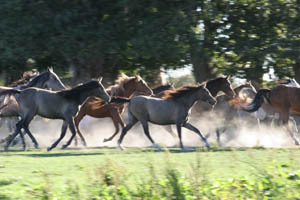 There's paddocks of endurance horses in various stages of training, paddocks of two-year-olds, mares and foals, and just weaned babies. Another horse heaven in New Zealand!